Seems we could use a menu guide for the game, as having no text might be a tad confusing for some. (Though I believe that was done to eliminate any issues with somehow not getting a version with one's native language.) So here are some screenshots with annotations. 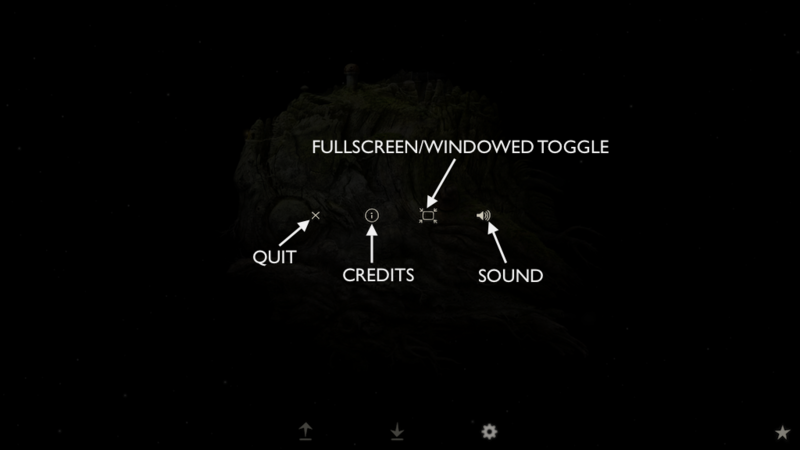 And in case it's not obvious, you'll always need to click on the star (or press Esc) again to get out of the MENU. Also note that there isn't a SETTINGS icon in the iOS or Android version of the game. 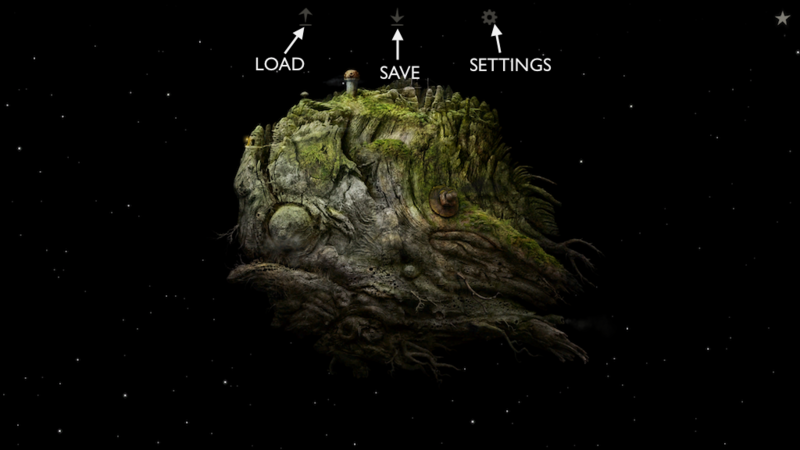 Back on the main MENU, click the icon with the down arrow to SAVE the game, and you'll see a screen with several circles, which are your save spots. Click on an empty circle to create a save of your current screen/location. Note that you can overwrite an existing save by clicking the 'x' underneath a save circle to clear it, though the first circle cannot be cleared because it's how you restart the game from the beginning (more on that below). Also note that you do not need to create a save spot when quitting, as your progress is saved automatically; the next time you launch the game, you'll continue from where you'd left off. Furthermore, the game automatically creates a save spot each time a new planet is reached. 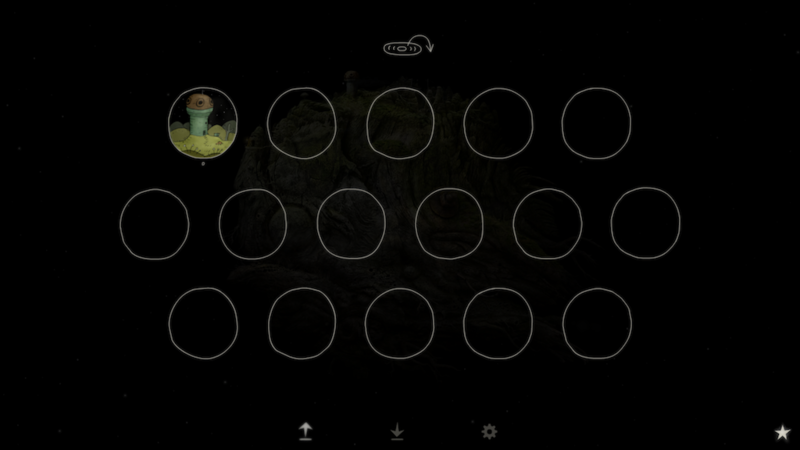 Back on the main MENU again, click the icon with the up arrow to LOAD a game, and you'll again see a screen with several circles (save spots). 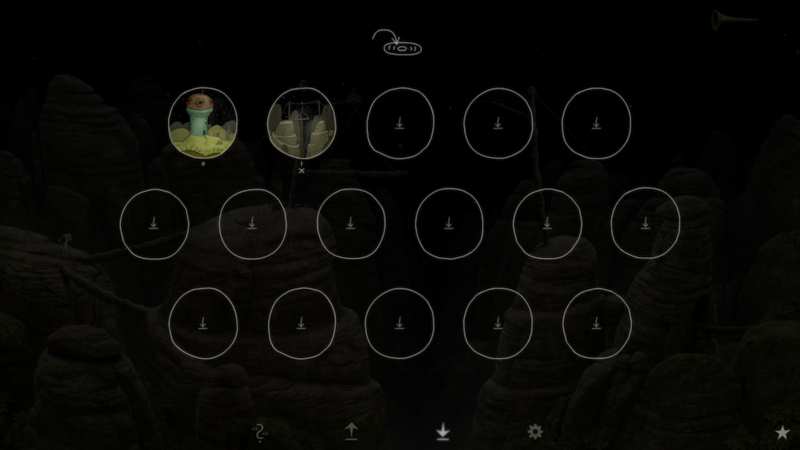 Click on a circle with a picture to load that particular saved game. Note that to restart the game from the very beginning, click on the first circle (numbered '0') showing the observatory house of the space gnome. But that's not everything, nope. 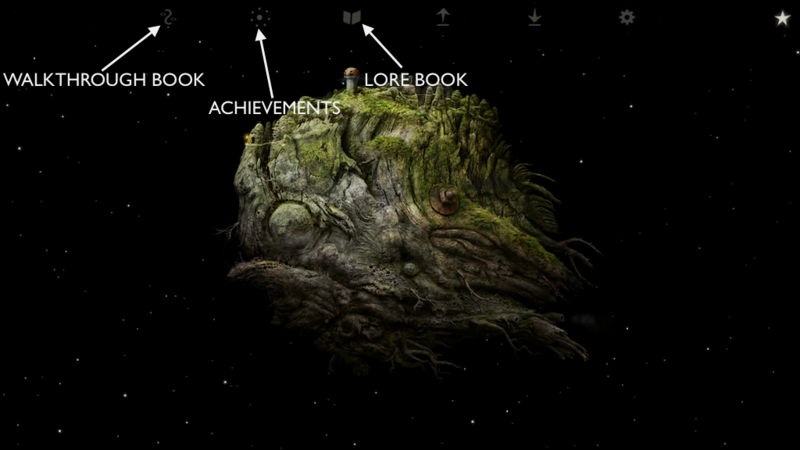 As you play the game, clicking the star will show you up to three new icons; from left to right you'll have the WALKTHROUGH BOOK (shows up on its own pretty much immediately), ACHIEVEMENTS (this icon will show up once you've gotten your first achievement), and what I refer to as the LORE BOOK (not spoiling how that shows up). Here is a shot of the front of the WALKTHROUGH BOOK. There are three concentric circles that can be rotated. LIne up the orangish seeds in each circle to open one of the closed eyes in the center; repeat to open the other eye and you'll open up the walkthrough book. (Note that the locations of the seeds are random, so the patterns will be different each time you use the book.) 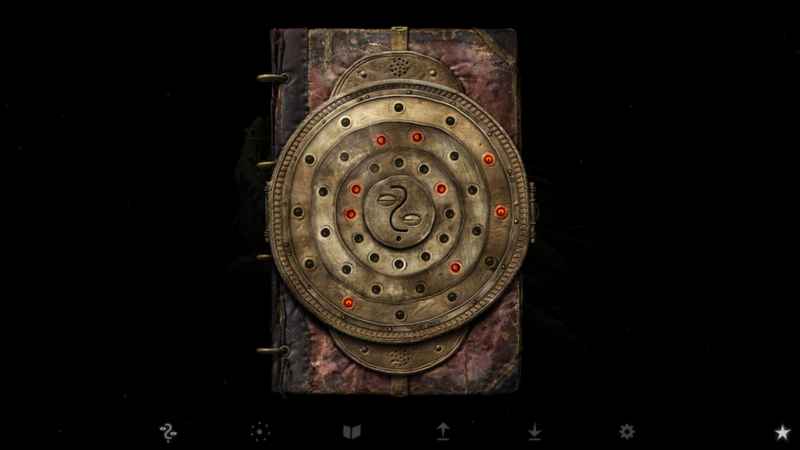 Opening up the book reveals pages which show a visual walkthrough for whatever screen you happen to be on when you click the book symbol. I'm not going to show a screenshot of any of the ACHIEVEMENTS because it would be a bit spoilerish, I suppose. That's it for now. I'll probably be editing this a bajillion or so times over the next day or so…just a heads-up. And any feedback is welcome. Thanks for this. It took me a while to figure it out myself, especially which was save and which was load. I hadn't noticed achievements yet so thanks for pointing out that it exists. Edit: I just checked achievements and if you click on one of them, something nice happens. I also just noticed that if you exit the game by mistake without saving (as I just did, oops) it picks up where you left off automatically. That's a handy feature. You're welcome. Yeah, I noticed that about clicking on an achievement. Very cool. Just my 2 cents: I found it totally self-explanatory. Great, thanks! I agree that it is, yes, but for several people (including myself), it took a minute or two to figure everything out (though some things, like the sound icon, were no-brainers); the guide is simply meant to help people figure things out a bit more quickly. I just checked achievements and if you click on one of them, something nice happens. To be honest I believe that a lot of players have used walkthroughs (the in-game one or on the internet), me included. There are certain puzzles that you won't understand at first, and I didn't understand the logic even after completing them like switching and connecting wires. To be honest I believe that a lot of players have used walkthroughs (the in-game one or on the internet), me included. By the way, welcome to the forum Philipsonh. You're in good company… we are ALL happily confused here! Gosh, the bomb puzzle!! The first time I actually did it in one try, was speed solving that wire labyrinth. On my next playthrough it took me a second try. What does the grasping hand animation mean? What do I do when I encounter the grabbing/grasping hand animation? Thank you. Sorry, which game are you referring to?